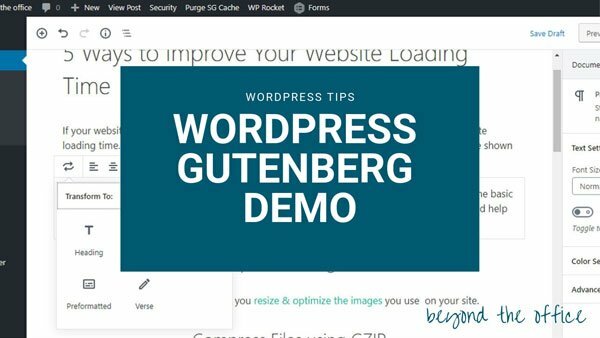 Gutenberg is the new editor for WordPress that was released with WordPress version 5.0. It’s an entirely different editing experience and has been confusing and frustrating many people in the WordPress community. The plugin has been available for testing as a plugin since development on it began. This allowed WordPress users to start using the plugin and testing it, and providing feedback to the development team all along the way. I’ve tested it using the plugin several different times, and it has been an interesting experience. If you’re not quite ready to jump into Gutenberg yet, or if you’re experiencing conflicts with the plugins on your site, you can install the Classic Editor plugin. Matt Mullenweg promises that the Classic Editor plugin will be available for “years to come” so you can feel assured that it will continue to be an option for you until you get better acquainted with Gutenberg. I recorded a video of working in the new Gutenberg block editor. Basically, the block editor is here to stay, so I highly encourage you to get used to it. Yes, it’s different but its easy to get used to. If you’re worried about how the new WordPress update might affect your site, I offer the standby advice of making a complete website backup before updating your site (and make sure you know how to restore the backup in case you need to), and you might want to install the Classic Editor plugin before you do the update. While I’ve heard of a few issues in the various groups that I’m in, most seem to have been fixed or mitigated by using the Classic Press plugin and/or making sure that the plugins and themes have been updated as well. I’m curious to hear your thoughts on the Gutenberg block editor. If you’ve tried it, please leave a comment below and let me know what you think. Share the post "What I learned writing a blog post in Gutenberg"